Conventional generation portfolios in Europe have had a tough two years. 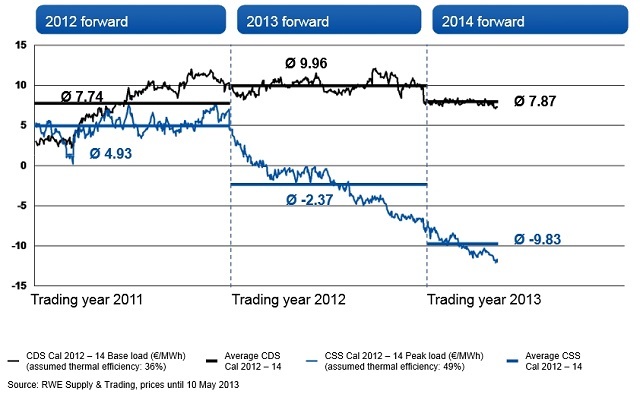 The policy environment has been hostile and the slide in wholesale power prices unrelenting. As load factors on thermal plant have declined, utilities have scrambled to reduce their generation cost base and increase asset flexibility. But these actions have done little to stem earnings erosion at a time when most balance sheets are already under pressure. Conventional generation portfolios in Europe have had a tough two years. The policy environment has been hostile and the slide in wholesale power prices unrelenting. As load factors on thermal plant have declined, utilities have scrambled to reduce their generation cost base and increase asset flexibility. But these actions have done little to stem earnings erosion at a time when most balance sheets are already under pressure. Material from a recent RWE investor presentation provides a useful case study for the plight of the generation businesses of European utilities. We have set out in a number of previous articles the drivers behind the deterioration of thermal generation margins. The key driver has been a substantial and growing overcapacity problem across much of North West Europe, particularly in Germany. Large volumes of subsidised renewable capacity have been developed by investors who are insulated from market price signals via ‘feed in tariff’ policy support. This has coincided with a period of weak demand. The impact on gas-fired generators has been exacerbated by a decline in competitiveness as coal prices have softened. Gas plants have been driven out of the merit order in Continental Europe as spark spreads have continued their decline into negative territory, illustrated for Germany in Chart 1. Full auctioning of carbon credits has not helped either, although the influence of carbon has diminished with EUA prices under 5 €/t. RWE has recently provided some insight into the pain that its 44GW of conventional generation assets are inflicting on its portfolio across DE, UK and NL. 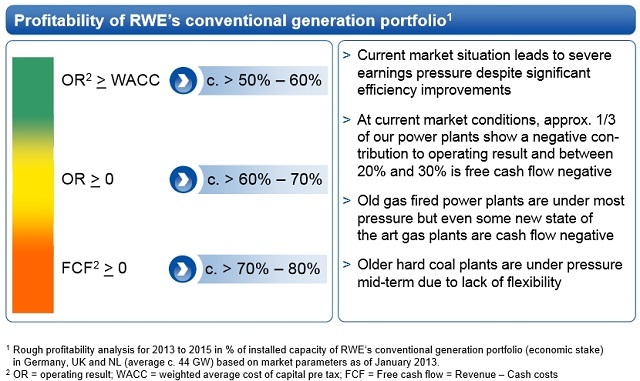 RWE states that 20-30% of its conventional generation assets are suffering negative free cash flow. This is presumably driven by gas plants that are not earning a return that covers station fixed costs. A further 20% of plants are under water on an Operating Result (OR) basis (once non-cash overheads are factored in), with OR either negative or below weighted cost of capital (WACC). This is a pretty grim picture for a generation portfolio that has historically been one of the pillars of RWE’s business model. It is also illustrative of a problem that most European utilities are facing. RWE and other utilities are responding to this environment by cutting operating costs, mothballing plant and in some cases closing or selling assets. Negative sentiment by the big utilities is reflected in unusually high levels of forward hedge cover on generation portfolios. 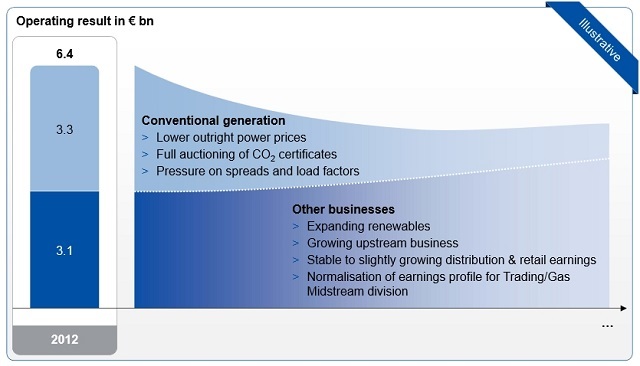 The decline in RWE’s projected returns on conventional generation assets is illustrated in Chart 3. At first glance (i) appears logical given it is renewable assets that are claiming generation market share from conventional assets. But when it comes to renewable investment the low hanging fruit have been plucked. New projects tend to be increasingly capital intensive and/or risky. An increasing consumer awareness of the cost of policy support is also creating headwinds. Utilities such as Centrica have been focused on (ii) and there again appears to be an attractive portfolio synergy logic. Exposure to upstream gas reserves can offset the negative impact of rising commodity prices on retail margins, in a world where tariff increases are under constant regulatory scrutiny. Centrica is a well managed company and a better bet than most to pull off this transition. But history has not been kind to energy companies or utilities that have based their growth plans on a step away from core business. Successful upstream companies have also typically had a very different capital structure and risk profile to utilities. Time will tell whether European utilities transform or shrink, but in the meantime deteriorating market conditions are likely to cause implicit or explicit writedowns in coventional asset value. Asset owners are striving for plant with a low fixed cost base and high flexibility. But for a number of older and less flexible thermal assets, the numbers do not add up. We suspect a more substantial capacity clear-out is still to come and this is just what is needed to stabilise the returns on remaining assets.